H. Kontova and G. Politi, "Two Italians in New York", Flash Art, Decmeber 1985-January 1986, p.38 (one panel illustrated in color). New York, Pat Hearn Gallery, Philip Taaffe, December 1984. Phillip Taaffe: Towards the end of the "Picture Binding Series" I had wanted to expand the scale, and do an all-over picture. 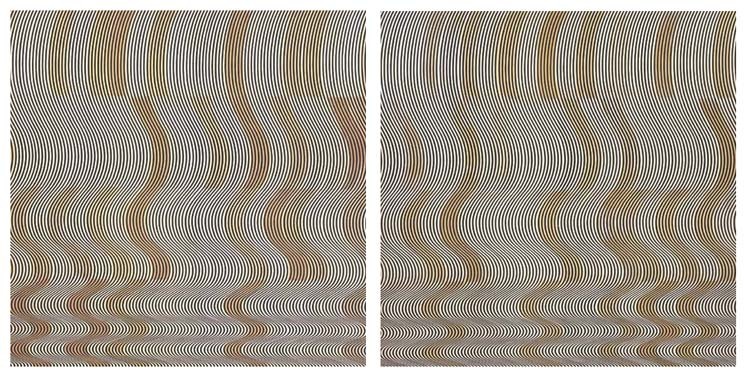 The visual tension, the play with positive and negative space in these works, and the opticality and the sharpness of the lines led to a reconsideration of op art. I thought it would be a logical next step. As I was going around the galleries I was seeing what Mike Bidlo was doing, and Sherrie Levine and Richard Prince also, so this whole idea of shifting one's historical perspective, one's relationship to the immediate past of art history was a very interesting prospect. In the meantime, I'd been going to wastepaper disposal plants in Newark, New Jersey in this big old '57 Chevy. I would drive to these plants where printers get rid of their end runs. I would go there for various rolls and samples, end runs of things like lightbulb packaging paper, and bring them back to my apartment in Jersey City. I had always wanted to surgically dissect a Bridget Riley painting, just take it apart and put it back together. I had all these rolls of paper and I decided to make linoleum carvings and print and collage the lines on this found paper. I dissected the wave in one of her paintings, and then another, and then a third, and I made the carvings based upon projections of these waves. They were very carefully engineered and surgically constructed, even if they ended up having a strange topography. Bob Nickas: I remember a Riley diptych that you titled Adam, Eve, and then of course there's Overtone. These suggest original sin, and echoes. PT: Well, the title of her painting was Fall, and an overtone is a reverberation, almost like an after-image in music. BN: What about this sense of being disobedient, or fallen? PT: I can tell you about a more recent episode. Bice Curiger curated an exhibition in Zurich at the Kunsthaus, "The Birth of the Cool." I was there at the reception, and Malcolm Morley was there as well. We were walking through the show and he was looking at these paintings of mine. One was after Barnett Newman, We Are Not Afraid, my answer to Who's Afraid of Red, Yellow, and Blue, and he turned to me and said, "Philip, that was a mistake. You know you shouldn't have done that, right?" And I said, "Well, you know, Malcolm, we all have to work through our own problems in our own particular ways." I had thought a lot about what I wanted to do or needed to do, or what I would learn from the most. I asked myself, "What is my identity as an artist, and what do I need to see made?" But I was also trying to declare myself a member of the tribe. I felt as though intellectually and artistically I was a part of that milieu. The New York School of painting, that's what was most formative for me growing up. My response to that was to make a liturgical reconfirmation, almost as a sacred act. BN: I recall the reception for your work when it was first seen in the mid-'80s as immediate; people got it right away.